Happy November everyone! Boy, I can't believe it's been this long since my last post. I hope you all enjoyed the rest of your summer and had a great Halloween. Just this past week I received a package of press samples from Born Pretty Sore. Usually it takes about 3 weeks for a package from them to arrive but for some reason this time it took almost 2 months! I was sure it was lost in the mail for good but eventually came (...at it's own pace). 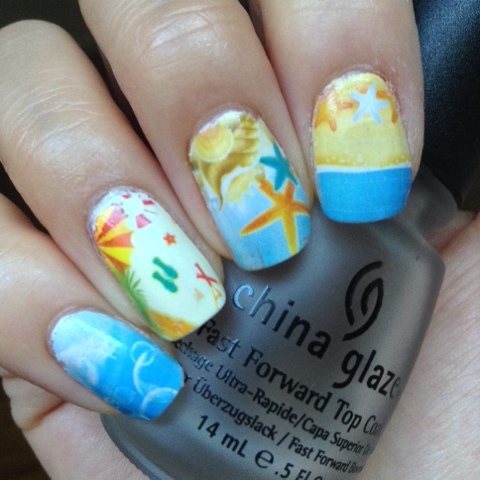 So the items that were selected were more summery so please pardon if some of the manis seem seasonally inappropriate. 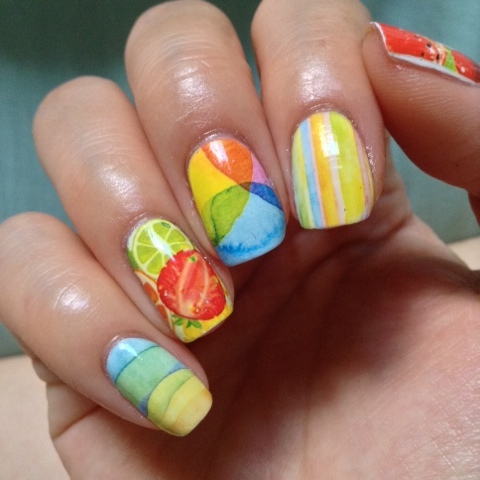 The first item I wanted to try right away were these fruity water decals (item #21984). 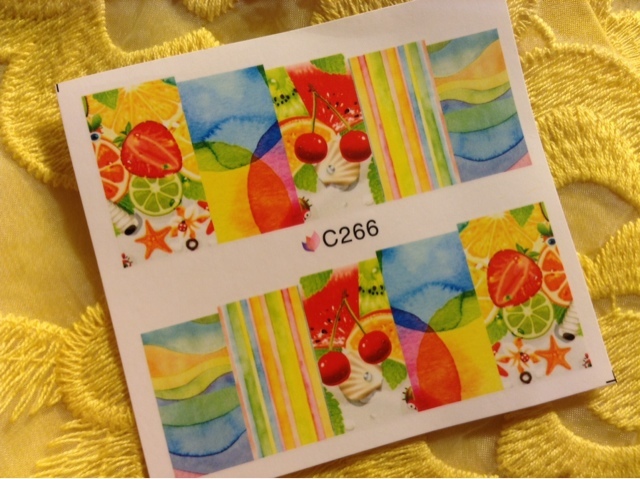 One sheet came with 4 different designs and was very modestly priced at $1.99 USD. 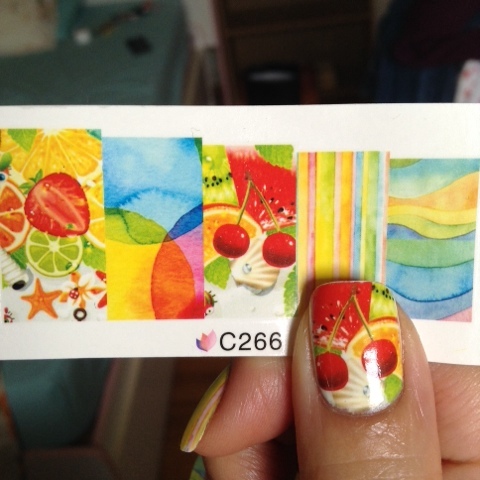 I decided to try style C266 first, I cut out all the designs and put on a white base coat on my nails. I anticipated the decals to be very sheer and needing a base coat but to my surprise the decals already had a opaque white base. Since the patterns are rectangular in shape you can either cut each decal down to for your nail or apply as is and clean up with acetone and a clean up brush. 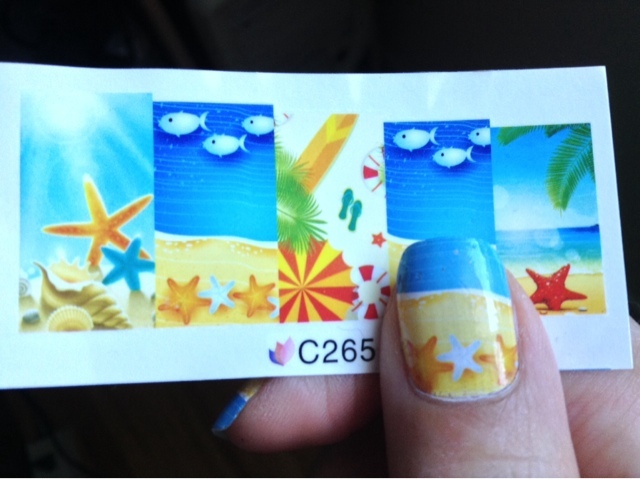 The second pattern I tried was C265. I tried this with no white base and had a lite bit if a hard time with the decal sticking on the bare nail. I had to be extra careful not to tug the decal excessively as I found the excessive movement causes the decal to wear a little bit when I applied topcoat. 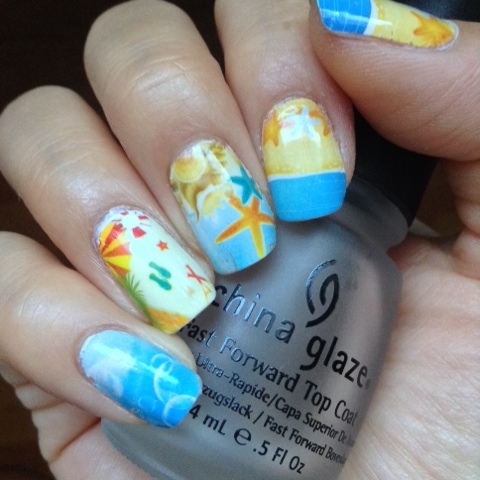 I thought these water decals were really cute and would've looked great worn during the summer time. 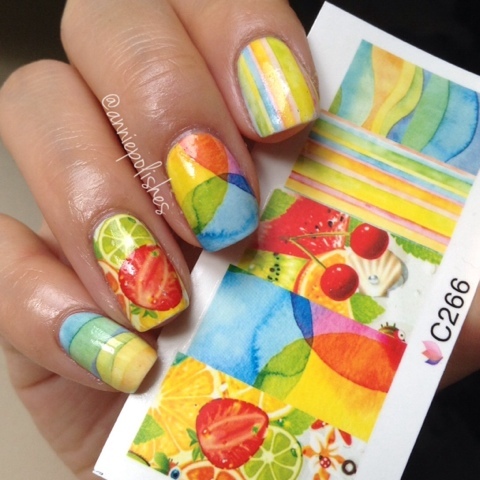 These decals would work great for people (like myself) who can't paint intricate nail art. They were easy to apply since no base coat was needed but very time consuming due to it's shape. Either you had to spend time trimming the decal to size or cleaning up with a brush. So, they're great if you don't mind spending some time to perfect the look.